All orders placed with Gotmedia.com are subject to these terms and conditions. We make every attempt to ship orders the same day if recieved before 2:30pm PST, but it is NOT gauranteed. We accept Visa, Mastercard and American Express as payment methods. Only Credit Cards that are issued by US Banks will be accepted. Foreign Credit Cards are not accepted. For orders being shipped to an address other than the billing address, your order will be placed on hold until we can contact you to verify credit card details. You can expedite this process by calling us after you place your order online. Phone orders are also accepted by calling 866-409-1090, 9:00 AM to 5:00 PM Pacific Time Monday through Friday except holidays. Phone orders are subject to order verification and agreement of Terms and Conditions via email or fax by the customer. After an order is placed online, you will recieve an Order Confirmation via email. If there is an issue with an order you will also be notified via email. You must make sure that you give us a proper email address and that you are able to recieve emails at that address without the interference of Spam Filters. Gotmedia is not liable for delays caused by an incorrect email address, an email getting stuck in a Spam filter or issues processing a credit card. Ink Cartridges and ribbons are not returnable. Defective cartridges are to be handled by the manufacturer. for instructions or call 866-409-1090. All returns must be assigned an RMA number. There is a minimum 15% re-stocking fee for returned products, in some cases the restocking fee could exceed 15% (the re-stocking fee may be waived if you reorder a replacement product of equal or greater value). We do NOT accept returns on opened products—of any kind. It is the customer’s responsibility to insure all returning items. Once the item is returned, undamaged, we will credit your card or account for merchandise only. Shipping charges to and from the customer are not refundable. Any defects or damages must be reported within 15 days of receipt of order. Equipment is not returnable after 30 days of invoice date and must be assigned an RMA number by calling customer service. Returned equipment within 30 days is subject to a 15% restocking fee plus shipping charges. Equipment is warranted by the manufacturer of the equipment, defective equipment is to be handled according to the manufacturer's warranty. Gotmedia is not responsible for the manufacturer's warranty. We try to keep all items in stock but we sometimes sell out of an item. We will notify you in the event of any delays due to this. Some products that we sell are special order items, your credit card will be charged before we can ship your items because they are special order items. Special orders can not be cancelled after we order from our vendor. We will notify you if a product is a special order item via email after your order is placed. Special Order items can not be returned. We will replace defective product reported to us within 15 days of receipt of the order. Replacement products are shipped via UPS Ground, expedited shipping will incur extra charges. Replacement products are shipped after we receive the defective product at our warehouse and it is inspected. Replacement products shipped prior to reciept of defective product will be considered a new and separate order. All shipping costs are shown when you place your order. Most orders are shipped the following business day from the date we receive it. We ship via UPS within the continental 48 states. We do NOT ship outside the continental US and we do not ship to PO, FPO or APO boxes. Free shipping orders (if applicable) can only be shipped UPS Ground. Please note: If you provide an address that UPS has to correct, move or request that a package be shipped to another address, after we have shipped it, you will be charged an extra $14.00 per box or label for a UPS Address Correction charge. If an order is refused after shipment, there will be a 15% restocking fee, plus freight to and from the ship to address. Jewel Cases and DVD cases are prone to breakage during shipping because of their fragile nature. We do not typically send replacements for broken jewel cases and DVD cases. If you have damage of more than 5% of the total order, then please contact us. DISCLAIMER: ANY ACTUAL, PROCLAIMED, OR INFERRED TRADEMARKS MENTIONED ARE PROPERTY OF THEIR RESPECTIVE OWNERS. GOTMEDIA.COM IS NOT RELATED TO OR ENDORSED BY ANY OF THE NAMED COMPANIES. LIMITATION OF LIABILITY Gotmedia.com is not responsible for typographical errors. Pictures are representative of product group, packaging may be different in some instances. 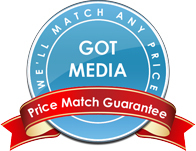 Gotmedia.com makes no determination of the specifications or warranties of the products we sell and shall not be responsible for any damages including but not limited to any defective products and/or late, lost, misdirected or incorrect shipments.